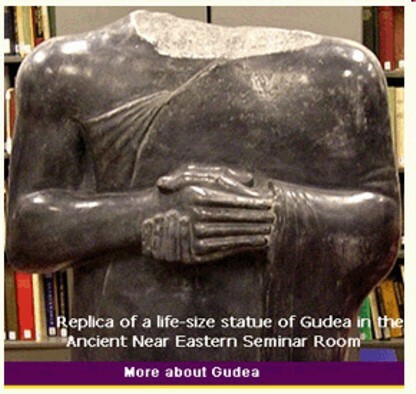 Gudea rose -- it was sleep; he shuddered -- it was a dream. Accepting Ning̃irsu's words, he went to perform extispicy on a white kid. He performed it on the kid and his omen was favourable. Ning̃irsu's intention became as clear as daylight to Gudea. He is wise, and able too to realise things. The ruler gave instructions to his city as to one man. The land of Lagaš became of one accord for him, like children of one mother. He opened manacles, removed fetters; established ……, rejected legal complaints, and locked up those guilty of capital offences (instead of executing them). He undid the tongue of the goad and the whip, replacing them with wool from lamb-bearing sheep. No mother shouted at her child. No child answered its mother back. No slave who …… was hit on the head by his master, no misbehaving slave girl was slapped on the face by her mistress. Nobody could make the ruler building the E-ninnu, Gudea, let fall a chance utterance. The ruler cleansed the city, he let purifying fire loose over it. He expelled the persons ritually unclean, unpleasant to look at, and …… from the city. The citizens were purifying an area of 24 iku for him, they were cleansing that area for him. He put juniper, the mountains' pure plant, onto the fire and raised smoke with cedar resin, the scent of gods. For him the day was for praying, and the night passed for him in supplications. 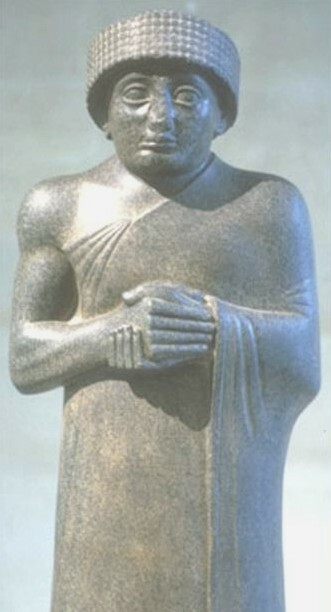 In order to build the house of Ning̃irsu, the Anuna gods of the land of Lagaš stood by Gudea in prayer and supplication, and all this made the true shepherd Gudea extremely happy. A missing head? No problem, make him White. European Albino features to ancient Black artifacts. 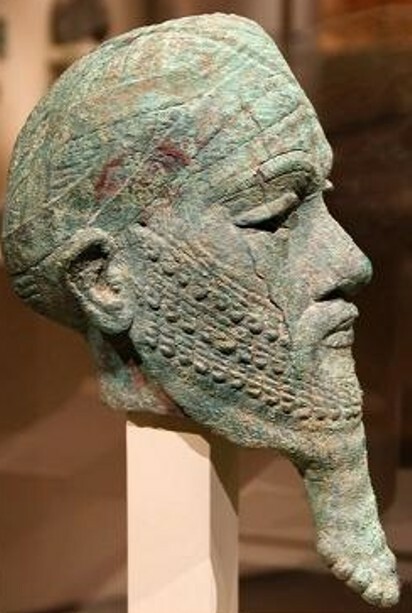 Erridu-Pizir (Erridupizir) was a Gutian ruler in Sumer from ca. 2141 B.C. to 2138 B.C. His reign is attested by a royal inscription at Nippur where he calls himself "King of Guti, King of the Four Quarters." His inscriptions indicate that after the Akkadian Empire fell to the Gutians, the Lullubi rebelled against Erridupizir. Note similarities with Naram Sin's Lullubi stele in Susa. 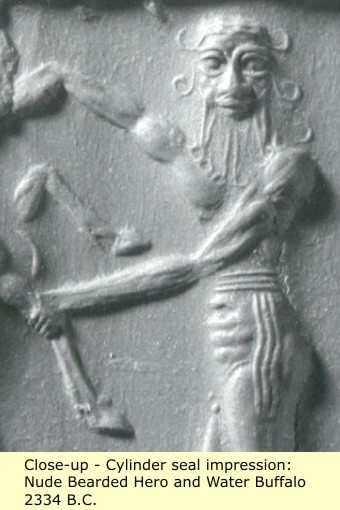 The Naram Sin stele was taken out of Sumer by the Elamite King Shutruck-Nahhunte in the 12th century B.C, he was a decedent of the Lullubi people and claimed to carry the stele there himself. The already ancient inscription was kept showing that the King respected Naram-Sin’s victory and wanted to keep the connection that this stele had. He did however add an inscription declaring his own glory and tells how the stele was carried out of the city after the pillage of the city of Sippar. Ur III - The third dynasty of Ur. After several generations, the Sumerians threw off the Gutian yoke, when in Uruk, Utu-hegal (2133 B.C.) came to the throne. Utu-hegal succeeded in driving out the Gutians, when he defeated the Gutian king Tirigan (in 2130 B.C.). Utu-hegal's victory revived the political and economic life of Sumer. 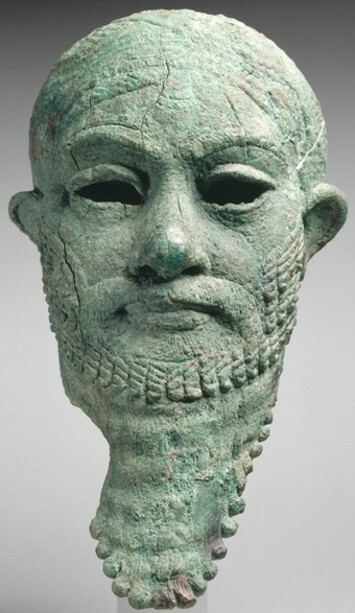 It was at this time that the Sumerian "King List" was inscribed. Upon the death of Utu-Hegal, one Ur-Nammu declared himself King. Ur-Nammu seized Uruk, and attacked and killed his competitor, Namhani of Lagash, whom he called "the traitor of Lagash". 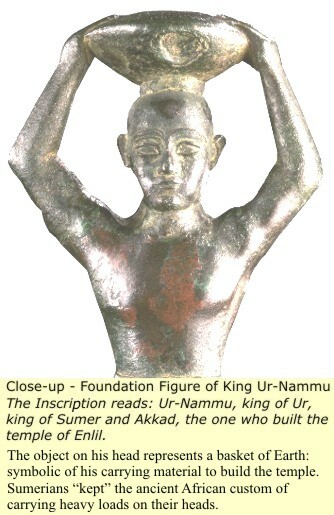 Ur-Nammu eventually ruled all of Sumer, and much of Assyria and Elam. Syria and Ebla paid tribute, and may well have been part of the Empire. Even Byblos (in Canaan), was forced to pay. This was the beginning of Ur III, (because by the Sumerian king list, this is the third time that the kingship was taken by Ur). 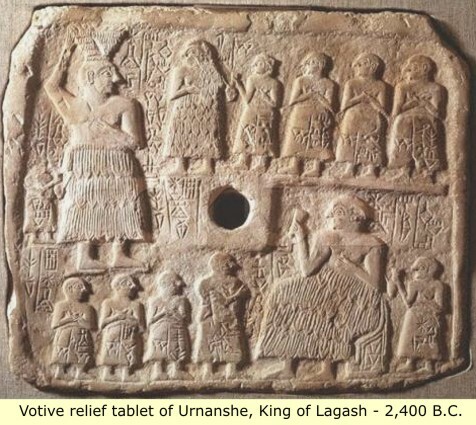 Ur-Nammu caused the coveted overseas trade from Dilmun (Indus Valley), Magan, and Meluha – Meluha means “black land”, the name of Egypt, so in all probability, the country that they are referring to is Egypt - to now flow through Ur, bringing great wealth to that city. The mother, miserable because of her son, the mother of the king, holy Ninsun, was crying: "Oh my heart!". Because of the fate decreed for Ur-Namma, because it made the trustworthy shepherd pass away, she was weeping bitterly in the broad square, which is otherwise a place of entertainment. Sweet sleep did not come to the people whose happiness ......; they passed their time in lamentation over the trustworthy shepherd who had been snatched away. Is this head real or a Fake? After Ur-Nammu died, his son Shulgi ascended the throne. By now the Gutians had overrun Elam, causing a greater state of anarchy there, than they had previously caused in Sumer. Shulgi wed his daughters to the rulers of Warshe and Anshan (Elamite cities). And then invaded and occupied Susa (the main Elamite city), he also installed a Sumerian governor there. Shulgi considered himself something of a poet. "Now, I swear by the sun god Utu on this very day -- and my younger brothers shall be witness of it in foreign lands where the sons of Sumer are not known, where people do not have the use of paved roads, where they have no access to the written word -- that I, the firstborn son, am a fashioner of words, a composer of songs, a composer of words, and that they will recite my songs as heavenly writings, and that they will bow down before my words..."
He later had to put down an Elamite revolt in Anshan. After which, Elamites were recruited into the Sumerian army, (willingly or unwillingly). He later led an army into Canaan, to punish the locals there for not sending him tribute. 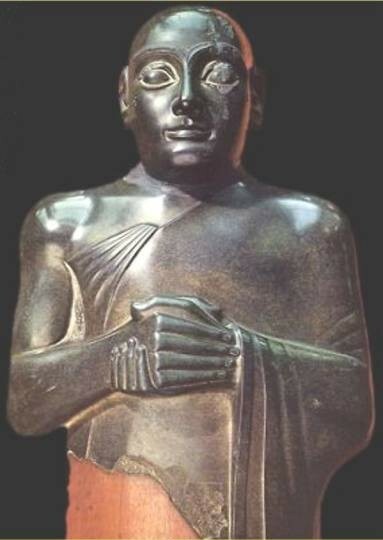 He may have tried to emulate Naram-Sin (an earlier king), for he took the title "King of the Four Quarters", and had himself deified (declared a god). A praise poem of Shulgi: translation. The king sailed to Unug towards the princely divine powers. Sumer and Akkad marvelled at him as he moored the boat at the quay of Kulaba. With a large wild bull of the mountains with uplifted horns, and with a sheep led by the hand of an en priest at his right side, with a dappled kid and a bearded kid clasped to his breast, he entered before Inana in the shrine of E-ana. when he treats me tenderly on the bed, then I will too treat my lord tenderly. I will decree a good fate for him! I will treat Culgi, the good shepherd, tenderly! I will decree a good fate for him! I will treat him tenderly in his ......! I will decree the shepherdship of all the lands as his destiny!" In battle I will be the one who goes before you. In combat I will carry your weapon like a personal attendant. In the assembly I will be your advocate. On campaign I will be your encouragement. You are a shepherd chosen by holy ....... You are the generous provider of E-ana. You are the pure (?) one of An's Iri-gal. You are worthy of ....... You are one who is entitled to hold high his head on the lofty dais. You are one who is worthy of sitting on the shining throne. Your head is worthy of the brilliant crown. Your body is worthy of the long fleecy garment. You are worthy of being dressed in the royal garb. You are suited to hold the mitum weapon in your arm. You are suited to run fast with the battle-mace. You are suited to hit accurately with the barbed arrows and the bow. You are suited to fasten the throwstick and the sling to your side. Your hand is worthy of the holy sceptre. Your feet are worthy of the holy shoes. You are a fast runner suited to race on the road. You are worthy to delight yourself on my holy breast like a pure calf. May your love be lasting! An has determined this for you, and may he never alter it! May Enlil, the decreer of fates, never change it!" Thus Inana treated him tenderly. Lets now pause for a moment, so that a people who will become very important in later history may be introduced. Sumerian and Akkadian inscriptions of the latter part of the 3rd millennium B.C, refer to a people called (MAR.TU-Sumerian) or (Amurru-Akkadian), later called Amorite. These seem to have been a nomadic desert people, who moved systematically in from the west. 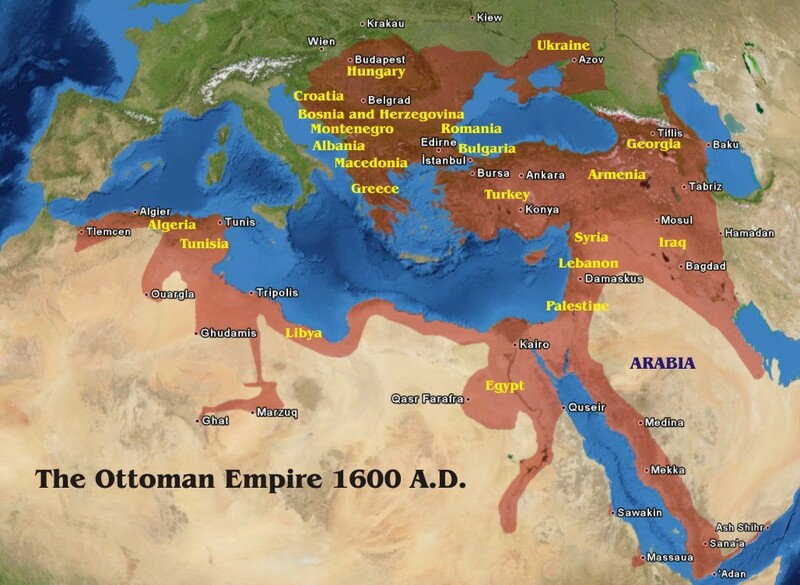 Their homeland was northwest of Sumer in the area stretching from the west bank of the Euphrates River on westward along the northern fringe of the Syrian Desert. The Sumerians called this land "Tidnum". From the early part of the second millennium B.C. onward, these people became more aggressive. These Amorites were already well known to the Sumerians. They described them as, "people who know not grain and do not live in houses". These Amorite people, will come to have a great impact in Mesopotamia, and in Egypt - where they will become known as Habiru or Hebrew! Now back to our history. By the time of Shulgi, the Amorites had become ever more aggressive until finally, there was open warfare and constant raids. This situation prompts Shulgi, to send his envoy Aradju, out into the country to visit his cities, and ensure their defenses and the loyalty of his governors. However Aradju, and this particular High-Official "Apillaca", do not get along. In previous letters to Shulgi, Aradju has complained to Shulgi that Apillaca has not made him welcome, and has been disrespectful to him (Aradju). This is Shulgi's letter of reply. The man to whom I have sent you is not your subordinate -- he will not accept orders from your hand! How can you ignore what he himself has done too, and that it is indeed so? As I myself ordered, you were to secure the provinces, and to correctly guide the people and secure the foundations of the provinces. When you approach the cities of the provinces, inform yourself precisely of their intentions, and inform yourself of the words of their dignitaries. Let my roar be emitted over all the lands. Let my powerful arm, my heroic arm, fall upon all the lands. Let my storm be released over the Land. Make the (Amorites?) disappear into the desert, and the robbers into the fields! Until you reach Apillaca, my 'Sage of the Assembly', (missing) Let (missing). That was how I had instructed you. Why have you not acted as I ordered you? If I do not make my 'Sage of the Assembly' feel just as important as I am, if he does not sit on a throne on a dais, furnished with a high-quality cloth cover, if his feet do not rest on a golden footstool, if he is not allowed by his own highest authority both to appoint and then to remove a governor from his function as governor, an official from his charge, if he does not kill or blind anyone, if he does not elevate his favorite over others -- how else can he secure the provinces? If you truly love me, you will not bear him a grudge! That very interesting letter, sums up the situation for king Shulgi, pretty well.